In 1952, Prof. Willy Messerschmitt needed a project to keep his RSM division busy, and a timely visit by his former employee Fritz Fend with a concept for a tandem two-seat vehicle resulted in a deal being struck. By the summer of 1952 a prototype was ready. 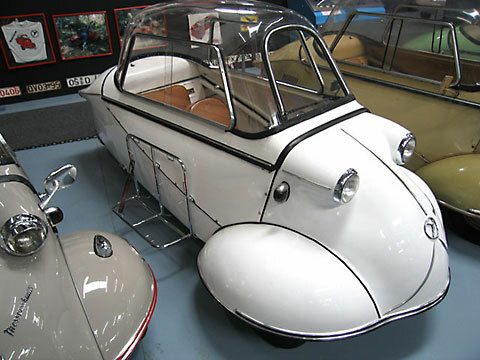 Called Fend Kabinenroller FK-150, it included all the elements of the first production Messerschmitts except for the plexi dome made up of several pieces, and the 150cc motor. Production began in February 1953, but early feedback indicated that the car was far from perfect: the suspension was very hard, it was noisy and rattled, and the hand clutch didn't come off well in practice. By June of 1953 some 70 modifications had been made. Wiper motor can be operated by hand and the open drive chain, among other things. This car also has an original side luggage rack. Weight: 180 kg Electrics: 12 v (2 x 6 v) 3 Wheels: 4.00 x 8"